How many light bulbs does it take to change a penguin? For the connection script to work properly, your Raspbian installation needs a few prerequisite packages. The most important of these is the PPP daemon “pppd” and IP Tables to route packages. In the next chapter we will download and install vmodem onto your Raspberry linux box! Make sure the serial-to-USB adapter is connected. If you do not see /dev/ttyUSB0 listed, you will need to update the script with the correct serial port. Visit this page to update the script with the correct serial port. If you do see /dev/ttyUSB0 listed, continue on! This would be a good time to test your network to eliminate any future headaches. Press Ctrl and Z to stop ping. PuTTY, Trumpet Winsock (Windows 3.1) or Dial-up networking (Windows 95) to connect to the Raspberry Pi. Over SSH, on the Raspberry, issue the following commands. If you see the READY text on the screen, the script is ready to accept connections. On your serial terminal, issue a couple of test commands, such as “AT” and then press ENTER. You may need to type AT a couple of times for VModem to sync up. If you get any error messages, take a note of them and look for commonalities in any steps you've taken before this step. Open up the script vmodem.sh for editing to make sure the baud and serial port are properly set. If you're unable to figure it out, feel free to contact me (see bottom of page). Make sure vmodem.sh is running on the Raspberry Pi first before attempting connection! 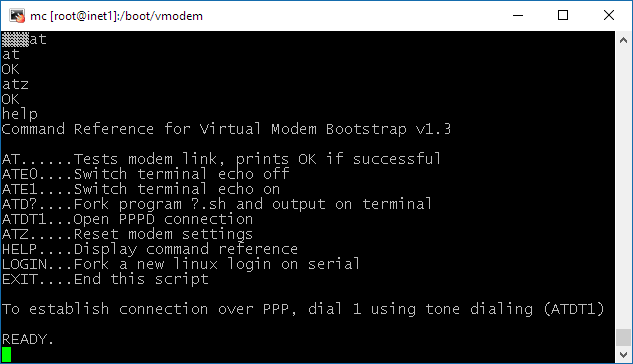 After you have verified that the VModem works properly on the console (see previous section), and you are able to connect to the Internet, you can make VModem run automatically as a background process after the Raspberry Pi is powered on. Restart Raspberry and test the changes. After rebooting, VModem should automatically start up with system processes and start expecting connections on serial.